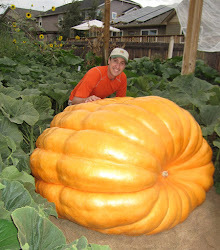 Andrew Pilger, a grower from Colorado pinged me this last week and came over on Friday. It was good to talk pumpkins and get caught up on the latest happenings from the RMGVG with him. That was followed on Saturday at the UGPG annual spring meeting. I would guess there was nearly 65 in attendance and a number of Facebook live for the beginner and advanced Seminars. The advanced seminar with done with two time world-record holder Ron Wallace, which was great. Ron is a wealth of knowledge, because he is into the science of growing. I've found that there are two groups of top growers. The scientist types and the feelers. The feelers tend to be growers that just know plants. Their experience allows them to just look at a plant and know what is going on with it and how to make it happy. The scientist types tend to be the types that can get into the smallest details of growing. The best growers are the types who can do both and Ron is one of those types of growers. 25 years of growing and researching makes him one of the best in the world. Sometimes you see world-record growers that got a good seed and knew enough to stay out of its way. But they are one hit wonders and you never see a giant pumpkin from them again. Other growers are consistently in the top 20 and those are the hardest working growers in the business. Again, Ron is one of those.